BOM (Bill of Material) extractor is a tool to extract information from Block Attributes and Dynamic Block properties of Autodesk® AutoCAD® blocks available in the Drawing File. The fields or columns to be displayed in the BOM table can be easily configured. The columns header name, width can be set by the user. The quantity will be calculated and grouped based on the number of same block information available in the drawing. Quantity (Base Quantity) per block instances can be configured in settings either as ‘1(each) or with any block attribute. Sorting of BOM items will be done based on the sorting settings and Items can be manually arranged and renumbered. Same value available in the adjacent row value can be merged with in each column. Merge settings is available in the settings. The BOM/BOQ layout setting can be configured through simplified User interface settings. It functions bidirectional. This tool can help you to extract information as well as it can update the block attributes in drawing as modified in user interface. 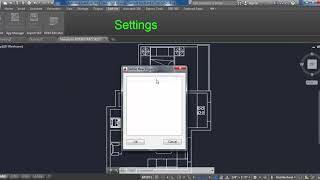 Migrated for Autodesk® AutoCAD® 2019.
very very very useful/ Thanks! Thanks for your feedback.We can provide this features in the customized paid version. Let us know if you are interested. In the customized paid version, what format would the data be? csv? thank you! In the customized paid version, what format would the data be? csv?&#13;&#10;thank you!